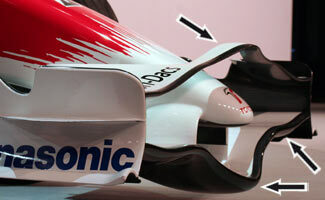 Despite late season efforts to improve the front wing by developing nose-attached upper elements, Toyota have opted to go the other way around and turn to a bridge wing that swoops over a lower nose. In fact Toyota cars have never had such a low nose at their launches. As marked in the image, it is vital to know that the wing is downforce neutral in the centre and there only acts as a stabiliser. Also marked is the thick main plate of the front wing, constructed so that it can carry a considerable amount of ballast (estimated at up to 20kg). Note that the endplates and wing profile are still similar to the most recent TF107. I seemd to recall reading that it was not permitted to add balast forward of the nose bulkhead. Or is it that it is not permitted to add balast in the nose? Either way, this was one of the things that tripped up Renault with the Mass Damper.... or was it? Doesn\'t really matter if the \"balast\" takes the form of a really heavy wing section. Lead afterall has really poor mechanical properties. Should be interesting seeing the mechanics hustling to change a nose/wing unit after the first lap contacts (maybe without Ralf this won\'t be so common) and the #$%@ thing weighs 30 Kilos.